what’s your dinner party strategy? ….or at least a few of the above, right? Of course you did. And then your guest arrives. You grab them a drink, show them where they can take a load off, point out the bathroom or where the snacks are, and get to know them a little better. Even if you aren’t the hostess with the mostess, it’s likely that none of this sounds strange to you. It is, after all, polite. I mean, they came into your house, right? Without a strategy, you’re serving cold pizza and your guests are checking their watches wondering when they can leave. And just like that well planned evening, running a business and building a community of raving happy customers is all about your Dinner Party Strategy™. 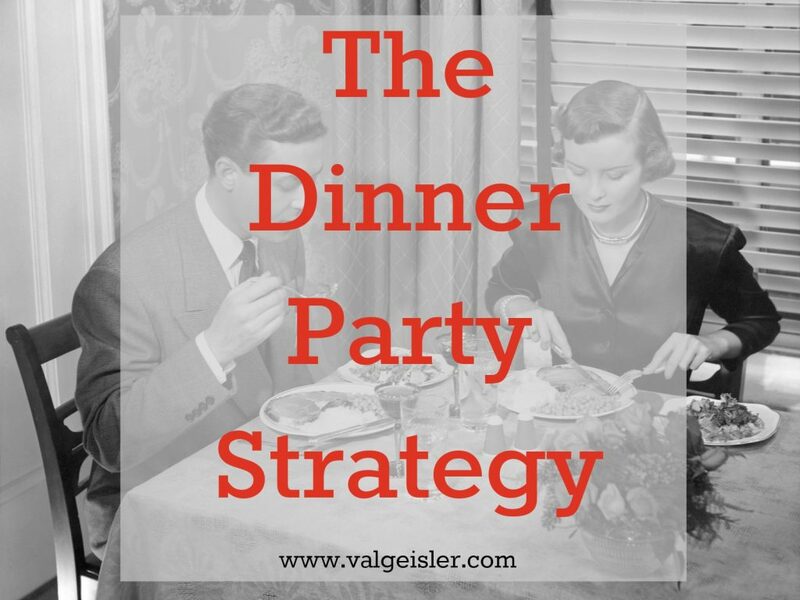 Running a business and building a community of raving happy customers is all about your Dinner Party Strategy. I click on a link a friend shared on Facebook and read your blog post. Do I see an invitation to join your email list below that post? Am I prompted to read other articles you’ve written recently? Do I know how I can work with you further? Maybe that invite to join your email list is there. I sign up in the box provided. Do I land on a custom thank you page? Is there a download of a checklist or workbook? Are my next steps clearly laid out for me? Is there a video explaining what to expect? You can do this right now with any of your customer journeys. Look at email signup, your contact form, signing up for your program, scheduling a free call with you, or applying to work 1×1 with you. Ask “And then what happens?” at every stop to see where things can improve. In the next few weeks, I’ll be hosting a webinar with my friend (and co-creator of Your Signature Experience) Suzi Istvan on the Dinner Party Strategy and all that this 4 week course has to offer. We’re packing our biggest brand building and client loving tips and expertise into this one hour webinar and we’ll even be sure to save time for your questions at the end. We’d love to see you there and you can get all of the details by adding your name to the waiting list for Your Signature Experience. There’s no commitment at all and nothing to buy now. All we ask is that you begin building your own Signature Experience and create the Dinner Party Strategy that keeps happy clients rolling in to your incredible business.